fossil fuels were the two main issues that formed this dissertation. UHI results in higher air temperatures in dense urban areas compared with their suburbs and rural surroundings. This phenomenon affects human health through thermal discomfort. Furthermore, in the Netherlands, it is estimated that by 2050 the air temperature could be up to 2.3°C warmer as compared to the period of 1981-2010. Besides, the energy consumption of buildings is responsible for 30 to 45% of CO2 emissions. 31% of this consumption belongs to residential buildings. Residential buildings can play a major role in reducing the CO2 emissions caused by fossil fuel consumption. One of the passive architectural design solutions is the courtyard building form. Courtyards have been used for thousands of years in different climates in the world. In hot climates they provide shading, in humid climates they cause a stack effect helping ventilation, in cold climates they break cold winds and protect their microclimate. 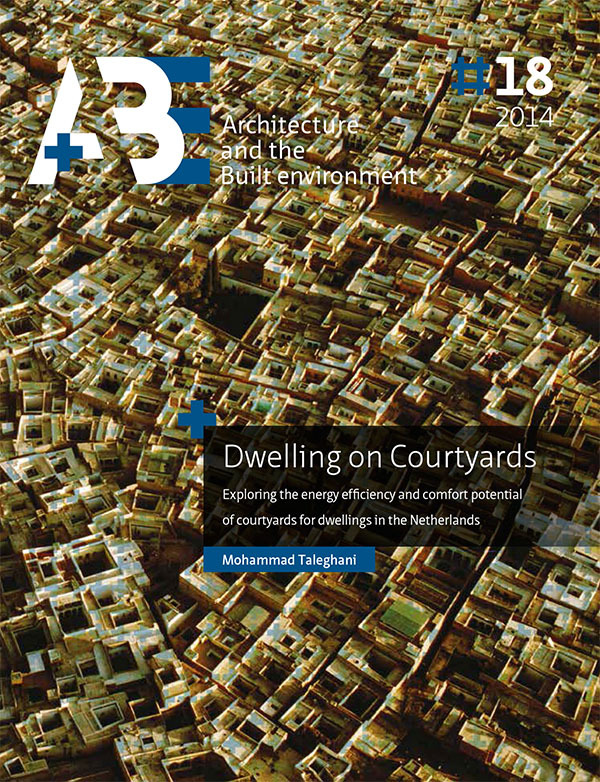 In temperate climates (such as of the Netherlands), the thermal behaviour of courtyards has been studied less. In this dissertation, low-rise residential courtyard buildings were therefore studied among (and along) different urban block types in the Netherlands. 1) To what extent is a dwelling alongside an urban courtyard more efficient and thermally comfortable than other dwellings? 2) To what extent do people have a more comfortable microclimate within an urban courtyard block on a hot summer day than within other urban fabric forms? since it is more protected. Considering thermal comfort hours in free running mode, the courtyard shape has the lowest number of discomfort hours among the models. Reducing the external surface area exposed to the climatic environment leads to higher energy efficiency and improved summer thermal comfort performance. Therefore, this analysis showed that the courtyard shape proves to be more energy efficient and thermally comfortable than other dwellings. For the second research question, the microclimate within the urban block forms previously studied (singular, linear and courtyard) were simulated, each with two different orientations (E-W and N-S, except for the courtyard). To explore their microclimates the simulations were done for the hottest day in the Netherlands (19th June 2000) according to the temperature data set provided in NEN5060. The results showed that the singular forms provide a long duration of solar radiation exposure for the outdoor environment. This causes the worst comfort situation among the models at the centre of the canyon for a hot summer day. In contrast, the courtyard provides a more protected microclimate which has less solar radiation in summer. Considering the physiological equivalent temperature (PET), the courtyard has the highest number of comfortable hours on a summer day. Regarding the different orientations of the models and their effect on outdoor thermal comfort, it is difficult to specify the differences between the singular E-W and N-S forms because they receive equal amounts of insolation and are equally exposed to wind. Nevertheless, the linear E-W and N-S forms are different in their thermal behaviour. The centre point at the linear E-W form receives sun for about 12 h. In contrast, this point at the linear N-S form receives 4 h of direct sunlight in that day. Therefore, in comparison with the E-W orientation this N-S orientation provides a cooler microclimate. To sum up the above findings, it should be said that this study showed that courtyard buildings as a passive design solution (originally from hot and arid climates) can improve energy efficiency and thermal comfort for Dutch dwellings. This building archetype can reduce energy demands for cooling, as a result being a good alternative form for the expected warmer future of the Netherlands. Designing small scale courtyards (single- family house) needs attention in winter. Courtyards provide more indoor and outdoor comfort in comparison with linear and singular forms. With this knowledge, it could be said that design strategies taken from one climate may be applicable in other climates but with serious attentions and modifications. Different disciplines and sciences can perform valuable roles to make this transition beneficial for the fragile ecosystem and people.